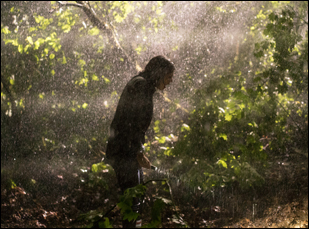 Never one to miss an opportunity for a good plot twist, Simon Barrett wasn’t going to miss the chance to watch Comic-Con attendees in San Diego as they filed into a theater to watch “The Woods,” his latest collaboration with director Adam Wingard. With a crowd already excited enough to see how the filmmakers could possibly top their last film “The Guest,” Barrett’s grin only got bigger as more and more mouths grew agape when the realization set in that these woods were in Burkittsville, Maryland and what this audience was seeing was a new “Blair Witch” movie – and like all great screenwriters, he could take particular pride in how there was just enough foreshadowing to make the turn of events seem particularly gobsmacking. Still, if there’s any justice, the “Blair Witch” Barrett and Wingard have made will catch on in the way the original did. Taking up the unenviable challenge of finding new territory to explore after “The Blair Witch Project” launched a generation of found-footage imitators, with many not seeing the forest for the trees, Barrett manages to have it both ways, connecting this new edition to the events of the 1999 shocker by following the brother of one of the deceased from the initial forest foray to find out what happened to his sister Heather with the help of his friends and a pair of locals more familiar with the rural area, while updating the cameras, which range from GPS-enabled headpieces to drones, and offering more sophisticated scares to reinvent and reinvigorate the language of horror filmmaking as the first film had. The less said before seeing the new “Blair Witch,” the better so as not to spoil the many surprises of the thrill ride. However, Barrett took the time to talk about the experience of covertly writing a “Blair Witch” sequel, using the technological changes of the past 17 years to build a better thriller, and the challenges the found footage format presents to screenwriters. During this now-famous secret meeting with Lionsgate, when you were pitched the idea of trying your hand at this, were you immediately receptive or did you have to think about it? I did have to think about it. Adam and I had an instinctive positive response, not just as fans of the first film, but because we’d just been hanging out with Eduardo Sánchez and Gregg Hale at Sundance for the premiere of “VHS 2.” It felt really serendipitous. At the same time, I’d never made a film before that wasn’t based on my own original concept – that’s not true, I wrote “Frankenfish” back in the day for the SyFy channel, but it had been years, and there was definitely something intimidating about going back to a seminal classic like “The Blair Witch Project” and trying to find a way to update it, and take it further. Certainly, I didn’t want to do anything that could in anyway lessen the legacy of the original film. Because it wasn’t like Lionsgate were like, “We want to do a new ‘Blair Witch’ movie” and I was like, “I’ve got a great idea for that.” They were like, “We want to do a new ‘Blair Witch’ movie.” and Adam and I are like, what actually is that story going to be? Who are those characters? What are our scares?” That was a little intimidating. At the same time, Adam and I have made a few films. We’re getting pretty good at it and we had a tremendous amount of unique experience in found footage, having worked on the first two “VHS” movies as directly as we did – regardless of the segments of those that we ourselves made, we were always giving notes to the [other] filmmakers on their edits, so we were very aware of what other people had done and how they’d achieved the scares that they did. And coming out of the meeting, it was like, “Okay, they are going to make another ‘Blair Witch Project'” – this is something Lionsgate seems serious about. They have Roy Lee and Steven Schneider are producing. One of the first things Adam said [after] was, “Well, look, somebody’s going to make this movie,” and if that’s true we are the best people to do it, because we know a lot about the mythology just by being fans, we’re friends with some of the original filmmakers and beyond that, we’re excited about the opportunity to make a very scary found footage horror film, having made the somewhat comedic version of that with the first two “VHS” movies. That’s what ultimately swayed me. Was it a mutual decision from the start to connect it to the original film? It seems like with the title, there might’ve been a temptation to simply reboot. That was actually something that our executives at Lionsgate, Jason Constantine and Eda Kowan, were attracted to right away. Very specifically at our first meeting, they talked about how they thought a cool approach to the story would be having a younger sibling of the Heather character who’s still tormented by trying to find out what happened to her, based on the events of the first film. Lionsgate’s idea was to do a very direct, sincere sequel to the first film, which it hadn’t had, and more of less follow the structure of the first movie. Adam and I agreed that that felt like the right approach because it wasn’t like we were making a sequel to a movie that came out two or three years ago where being more experimental would be the right creative move. [This had] a burden of reminding people of what happened and where we’re at and what this mythology is. Then for me, it was just a matter of finding out who those characters were [with connections to the original] and then add some new characters to give the group a different dynamic from the start. My goal was just trying to find a way to do as many things that were very different from the first film while still being respectful to the original film’s mythology. My first draft was a lot more different than what they were expecting [at Lionsgate], and it just got weirder from there, but at the same time, they were happy. In your work with Adam, there generally is a culture clash – that gives an extra dimension to the story and adds quite a bit of tension. Here, the group is comprised of urbanites and hillbillies, for lack of a better terms. Are those kind of differences a starting place for you or do they creep in as you develop the story? I’m certainly always thinking about cultural anxieties and certainly the original “Blair Witch Project” beautifully plays on this primal, human anxiety of being lost and hungry in the woods. There were certain things, [like] modernizing the technology where I thought it was interesting to play on the anxiety of how reliant we’ve all gotten on our devices so quickly in the intervening years between the first film and the film that we were making. The big plot line [of “The Blair Witch Project”] is all about them losing a map, and today’s teenagers that will see our film, I think have no idea what to do with a map and a compass because they have a device in their pocket that is vastly better for navigating. But I tend to find the cultural anxiety of urban teenagers at odds with their rural counterparts that you see very often in horror films pretty annoying, actually. Maybe that’s because I’m from a small town in Missouri, and [in] the dynamic, as you said it, I probably would grouped in the latter camp. Adam’s from a small town in Alabama and I think, if anything, he probably feels the same way. So we actually wanted to play a little bit on that dynamic, where we knew, to modern audiences looking at various tropes of horror cinema, the rural characters are going to be immediately untrustworthy because it’s this well-established cliché in cinema, which I personally think is a silly, self-congratulatory one for the most part. It’s mostly Los Angeles based screenwriters showing how much smarter they are than everyone else, and it wasn’t about exploring that tension because that has been explored in many films, ranging from “Texas Chainsaw Massacre” to “Wrong Turn.” In “Deliverance,” most notably. But in the fun dynamic of that, I did want to show Burkittsville locals’ side of things, so there’d be a more amusing and interesting tension within the group from the very beginning and a new way to play the audience’s loyalties from scene to scene, to give the film some different perspective shifts and plot twists in terms of who the audience believes at any given moment. Ultimately, I wanted it show that actually the rural characters had a better grasp of things in many ways, than our protagonists. On “The Guest,” I remember you saying that you and Adam more or less kept the writing and directing processes separate. Because of the nature of this, where the cameras used are such a part of the story, did those processes mesh more here? They did a little. Adam and I still kept our basic working method where I didn’t talk to him about the script until I had a complete draft, more or less. My first draft did establish all the cameras and as much as possible tried to indicate the perspectives from which I thought certain moments would be viewed from. Again, this is not my first found footage script, so I had a sense of how to do that [in a way] that worked for our particular filmmaking method. Obviously, there were a lot more cameras in this film and it was a lot more technically ambitious. Once Adam read [the first draft] and was happy with it, we did open up the conversation a bit more about how the cameras should be described specifically. The earpiece thing was in the first draft from the start and one of Adam’s first notes was that we needed to add that they’re handling different cameras in different scenes to make sure that we have different perspectives and a bit of visual variety. It was absolutely necessary because I think why a lot of why found footage has such a bad reputation is because a lot of it’s so stagnant because of the limited angles and the kind of edits you can do before it starts feeling incoherent. If anything, there might be more camera angles in the film than are in the script because we needed them to give those scenes a logical editing flow and natural in and out points. Generally, our usual creative system worked, but it was just a little different this time because normally it’s just Adam and myself and our producers on “The Guest,” Jess Wu and Keith Calder. In this case, we were working with a couple of executives at a studio, which was a new experience for us, but ultimately a very positive one. They were very respectful to our process as well and let us do our thing. I guess that’s why they hired us – because they liked what we did. You brought something up that I wondered – in found footage is it trickier to get in and out of scenes or actually easier? You can make those abrupt cuts, if you want. It’s very hard to do well. One thing that I did in the script, very much with Adam’s blessing, was I tended to write longer versions of scenes than I knew we weren’t going to use, so it would still have a very spontaneous, authentic feeling to [when you] cut in mid-scene the way that a real documentary would be assembled. That way the actors didn’t have to create that feeling from the start with improv or if they were doing improv, they had scripted lines that they could riff on. There were a bunch of challenges [writing found footage]. It’s very hard to stage a scare in found footage in certain ways, because all the tools you use to make a moment scary in normal horror cinema – score, sound effects, choosing the camera angle and how something is revealed and how it’s edited – you can’t really use any of those tricks if you’re playing it straight so that the audience can obtain the suspension of disbelief that I think good found footage achieves. With traditional film coverage you can cut whenever you want to and with found footage, you really can’t because it only makes so much sense that a camera would be covering something at any given time. The script tried to compensate in certain ways for the fact that we’re just going to have to figure some of these scenes out because we shot long versions of early scenes and then had to re-shoot a couple of them when Adam had got in the editing room and realized we didn’t have organic editing points that would get us out of these scenes efficiently. This is a mild spoiler, but it’s one of the film’s deeply unsettling master strokes, which is when it’s discovered that the sun stops rising in the woods. Logistically, that means night shoots, which most filmmakers typically dread, so was it a difficult decision to make? No, not at all. One of my biggest concerns, when Lionsgate first pitched this project to us, was that being out in the woods is very scary at night and relaxing and pretty during the day, and just knew that characters out in the woods with flashlights at night is scary and characters walking through a lush forest in broad daylight is far less so. The first film gets a lot out of just the absolute authenticity of what they were doing and if you really look at the original “Blair Witch Project,” it’s definitely implying that the actual curse on the woods results in the people that are caught up in it being somewhat displaced in both space and time, so I very much embraced that concept. After carrying this big secret for three years, what was it like to walk in to that Comic-Con screening promoted around town as “The Woods” and walk out seeing all the “Blair Witch” posters and finally being able to talk about it? It took me a few hours to come down from the adrenaline of that. Obviously, I knew what Lionsgate had planned, but there was always that idea in the back of your head of like, is this going to work? Because we knew were attempting something pretty unique with our three-and-a-half year effort to keep the film a secret, then not to just reveal it and be like, “This movie is “Blair Witch’ that comes out in two months,” but be like, “Hey, we’re going to show it to you and you’ll figure out watching it what it is.” I thought that was really cool. We always like to not promote our stuff too much, because as a viewer I like to not know a ton about movies going in. We were very much on the same page with Lionsgate that that was a great idea and it took quite a bit of effort, which I’ve talked about in other interviews. There always was this fear that a month before it came out something was going to leak and it just never happened. Rumors were fine as long as nobody had actual evidence. Honestly, in a weird way the highlight of this entire experience so far for me probably took place about halfway through our San Diego Comic-Con screening when I realized that the audience was really enjoying it and the whole thing was going to be seen as a positive fun surprise and not us just pointlessly lying to people, because it felt like it could have gone either way for a little while there. So I’m thrilled with Lionsgate for having the weird confidence to do something like this. We held up our end of it and it really seems to have paid off. 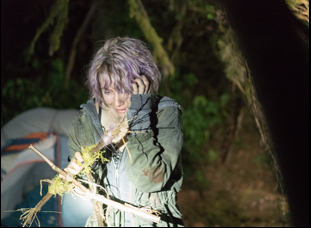 “Blair Witch” opens in wide release on September 16th. TIFF '16 Interview: Ellie Kendrick on Giving Dimension to "The Levelling"